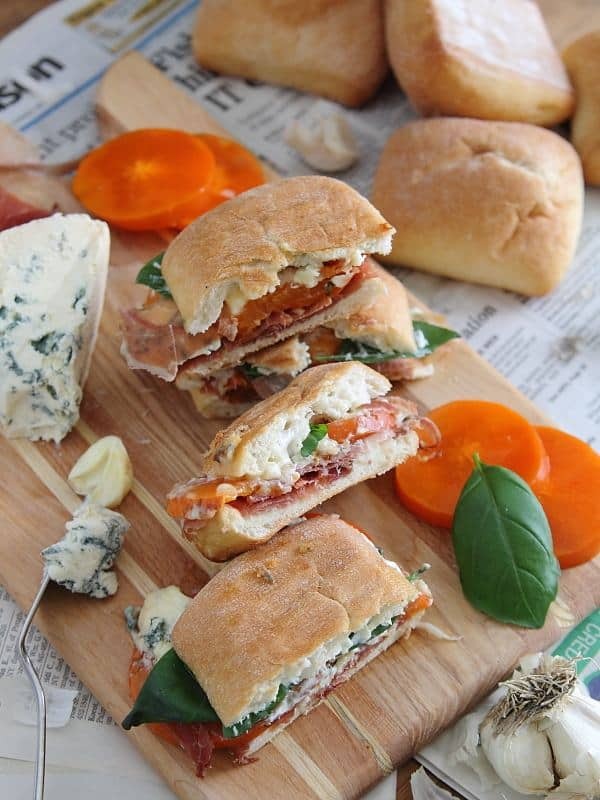 This persimmon prosciutto panini is filled with triple cream blue cheese and fresh basil. It’s a deliciously salty & sweet combination! On Wednesday I went to a taping of The People’s Court. I know, totally random. Honestly, I haven’t seen an episode since way back in the day when judge Wapner was around and I was approximately 11 but Brandy is, well, let’s just say very enthusiastic about this show and somehow managed to get audience passes. She promised a stop at Trader Joe’s on the way home and that was pretty much all she had to say to get me on board. You guys. If ever in life you need to feel better about yourself seriously, just turn on this show. The hot messes that appear before your eyes will instantaneously make your jaw drop with profound amazement at how they survive in this world and whatever “woe is me” path you were on will do an about face. Case #1: Two girls attend a college function. Plantiff puts her purse with her computer in it down on a chair with her jacket on top. Defendant puts her belongings on top. Both of them go get pizza and drinks, come back to their seats, put both their glasses on the floor as there were no tables at this event and eat their pizza. Minutes later, they hear a thud and the plantiff’s computer is now on the floor in a pile of water because it hit the defendants glass on the way down. Her macbook now needs $800 of repair and she wants the defendant to pay for it since it was her glass of water the computer fell on. Case #2: Plantiff sells her 1998 (let’s just do some quick math, that’s 13 years ago…ok?) Plymouth van to the defendant for the sum of $700 after her mechanic looked the car over and told her to buy it. There was a dvd player in the van that the plantiff gave the defendant the option to purchase in addition to the $700 otherwise she was going to remove it. Defendant signed a contract and agreed to pay $300 for the dvd player and a $50 late fee if it wasn’t paid by a certain date. Two months later, the defendant hasn’t paid for the dvd player at all. Her defense? The car has broken down 2 or 3 times and she’s had to put money into it. She claims she was sold a lemon. Yes, because apparently $700 13 year old cars should work perfectly. The best part of this case however had nothing to do with the stupidity and more to do with the see through backed red lace shirt the defendant wore to court making her black bra straps and pretty unsightly back fat visible to every audience member seated behind her. That was a treat. And then there’s case #3: Honestly, this one is too complicated to understand but it basically involved some dumb women putting an acquaintance on her cell phone bill, buying him a phone and then getting mad and wanting the phone back when he couldn’t make his payments on time. Because the fact that a grown 40 something year old man couldn’t get his own phone contract wasn’t enough of a red flag to her to begin with. Judge Milian even asked if her motive behind doing this was to sleep with him because no one could even grasp why she thought this would be a good idea. Shockingly, they both said no relations of that sort were had. So the thing that bothers me about all this is these people GET PAID to come to court. These are real cases that exist in real life. Some producer filters through thousands of cases, picks these winners and then gets them to come to The People’s Court but even if they are dumbasses that buy $700 cars and expect them to run like a brand new BMW, they get paid to be there. They can be 200% guilty and they walk out richer then they came in. Apparently, that’s justice in America. Wtf. I had a lot of pent up frustration leaving that taping and walked into Trader Joe’s all worked up. It resulted in me leaving $122 poorer but with a $5 triple cream blue cheese that made me forget the stupid and focus solely on how it was going to get in my mouth. 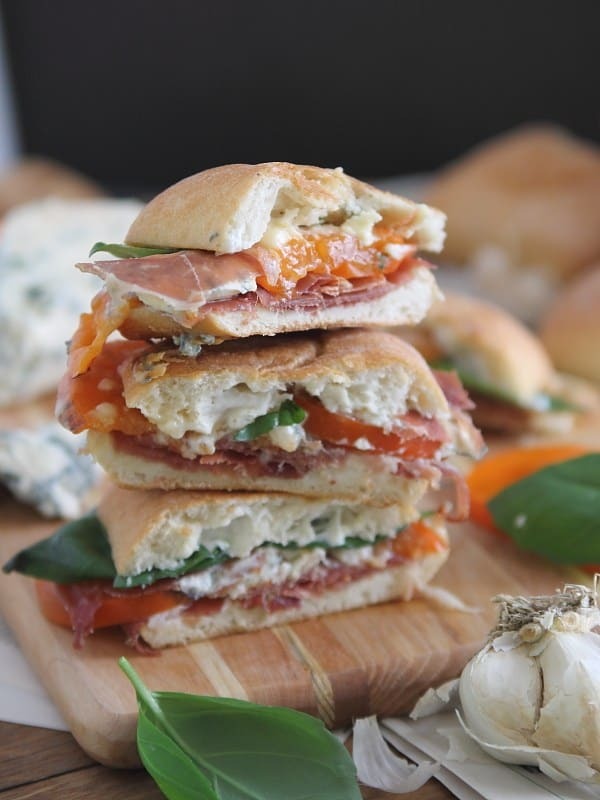 Answer: sandwiched and pressed between prosciutto, persimmon, basil and garlic yogurt spread. 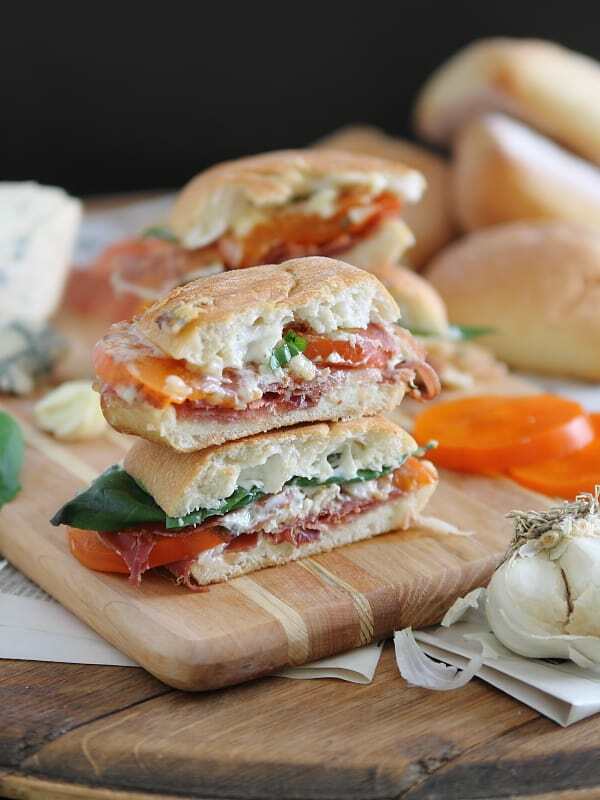 This persimmon prosciutto panini is filled with triple cream blue cheese and fresh basil. It's a deliciously salty & sweet combination! Mix the mayonnaise, yogurt, garlic, olive oil and salt & pepper in a small bowl. Spread the yogurt mixture onto each slice of bread. Layer the half of the prosciutto on top of the yogurt, then half of the persimmon, half of the blue cheese, then the basil. Top with the other slice of bread. Repeat with the other roll. Press both sandwiches in a panini maker or in a hot pan until the cheese melts and starts oozing out the sides. I really need to hop on the persimmon train! I’ve seen them at some little grocery stores here and never buy them. However, anything pressed between carbs and cheese makes my belly very happy. I love how creative this is! My jaw dropped when I saw this in my inbox. OMG I have got to try this! Looks amazing! so many deliciousness in just one bite. What an amazing flavor combination for a panini. This is definitely a must-try in my book! 1998 was fifteen years ago, not thirteen. Ha, thanks. Guess my brain was on vacation when I did that math. Gina, This post is so funny. I love thinking about these characters. Scary that they are real people! I like your advice to watch it if I need to feel better about myself. And these sandwiches. My mouth is watering. Must eat!! !